NFL Picks: Where Will Donovan McNabb Play in 2011? 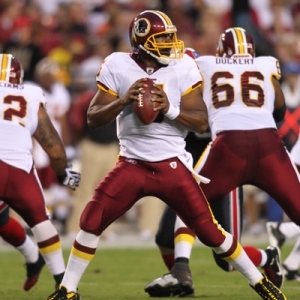 Is there really any chance that Donovan McNabb remains with the Washington Redskins? Of course, McNabb was benched by Mike Shanahan for the final three games of the season. However, McNabb said he’d like to return to Washington next season. And Shanahan said he would welcome him back – as the backup. But McNabb’s agent blasted Shanahan and his offensive coordinator son Kyle for their handling of his client. Even Mike Shanahan acknowledged late in the season that things were like a "soap opera" and that essentially was a mistake for the Skins to have traded for him. Thus, the Redskins are expected to try and trade McNabb, who cost them second- and fourth-round NFL draft picks to acquire from Philadelphia less than 10 months ago. However, McNabb is 34 years old and coming off his worst season statistically as a full-time starter. He has little trade value so the Skins probably will just cut him even though GM Bruce Allen said last week that wasn’t in the team’s immediate plans (yeah right). McNabb is due a $10 million roster bonus if he stays under the terms of a contract extension he signed in November, and there’s no way the team will pay him that. So where might he end up? Bodog has several potential landing spots for the six-time Pro Bowler and I will offer some NFL picks for this prop. For starters, the site lists McNabb starting Week 1 of the 2011 season at -300 with McNabb not starting the opener at +200. And the Redskins are one of the team options, with McNabb starting the Skins’ opener at just 10/1 and the longest-shot option. A free agent quarterback is the even-money favorite while a 2011 draft pick starting Week 1 is at 5/2. Rex Grossman, who started the final three games and played decently well, is at 7/2. The favorites for McNabb’s services are the San Francisco 49ers at 3/1. And this would make some sense with McNabb a good fit in the offense that new coach Jim Harbaugh plans to install. Former No. 1 overall pick Alex Smith is likely not going to get another shot with the team, and certainly the Niners could draft a quarterback early in this year’s draft. But McNabb would be a good bridge to let whoever that QB is learn from the sideline for a season or two because the Niners have enough talent on their roster to win the NFC West next season. How about another playoff-caliber team like the Minnesota Vikings? McNabb is 5/1 to be Minnesota’s Week 1 starter next season, trailing only Joe Webb on that prop with Webb at 5/2. McNabb was long rumored to be a target of former Vikings Coach Brad Childress, who was McNabb’s offensive coordinator in Philly. But, of course Childress is no longer with the Vikings. All this just assumes that Brett Favre is retiring, and Favre did file his retirement paperwork with the league on Monday, although he did that a few years ago too. Minnesota also could be a contender next season with the right quarterback, so it’s hard to see the Vikes turning things over to Webb in 2011 considering he wasn’t even drafted as a QB but as a receiver. Look for the Vikes to perhaps pursue Denver’s Kyle Orton, who so happens to be 6/1 on this Bodog prop to start Week 1 next season (tied with Vince Young at 6/1). Finally, the site lists the Oakland Raiders as a possible destination at 15/2. The Raiders were a top suitor when the Eagles put McNabb on the market last year before Oakland got Jason Campbell from Washington during the draft. Reportedly McNabb refused to go to Oakland last year, but he might not have any other options this year. And the Raiders could use a quarterback because Campbell really didn’t pan out all that well. Certainly don’t look for anything to happen until a new CBA is signed, but McNabb won’t be a Redskin next year as he still thinks he’s a top-level starter. The Vikings probably are the best bet on this prop but don’t rule out McNabb going to Miami if Childress is hired as the Dolphins’ offensive coordinator.